This weekend I sported a really fun look! Classy and girly. :) I kind of tried it on a whim on Thursday evening and it's held up really well. 3 days in and I can definitely go another, maybe 2! It was so fun to create this. 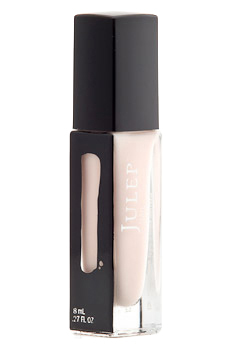 I used Julep - Kelly. This is a really accurate representation of the colour. SO pretty! 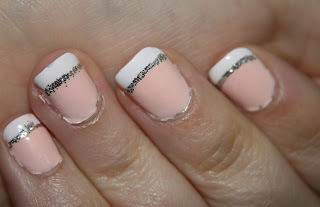 To recreate this look, you just freehand the white tip, it doesn't have to be perfect. The line of silver is just a little bottle of Stickles glitter glue from my stash of neglected scrapbooking supplies. I *LOVE* this look. I have about 40 bottles of Stickles to play with and 10 bottles of perfect pearls and another 10 bottles of distress glitter! This is a stock picture from their site, pretty close (but much lighter) to what the shade looks like. Very cute design, I love the glitter lining! Nie jest perfekt, ale lubie. :) Dzienkuje! Bardzo lubie twoj blog! so the whole world. if you want you can take part :) Regards and great nails! ahh yay! :) Thank you! oh wow -- you did a really excellent job! i'm really crap and doing my nails, so i don't even attempt to do them. ha ha! i'm always jealous of bloggers like you who have pretty nails. love these, must try ox.